In this book, a university lecturer contradicts Albert Einstein. Cambridge University–trained theoretical physicist Joao Magueijo contends that one of the central tenets of theory of special relativity is wrong in that, contrary to Einstein’s famous hypothesis, light does not travel at one speed and one speed only. Dr. Magueijo believes that light traveled faster in the early universe than it does today, and he argues that this scientific speculation can help explain nagging anomalies in cosmology and the history of the universe. This book was a great read. 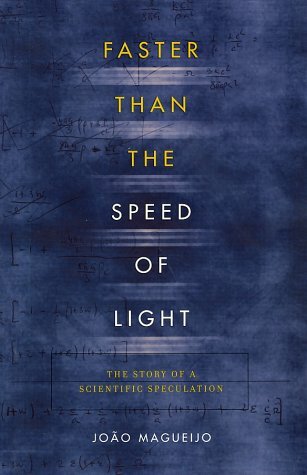 Despite being a book centered around some heavy physics I found it super accessible. I do have a barely remembered year as a university mathematics major but anyone with a few brains and an interest in the subject should have no trouble wading through when the book gets technical. Review over. Now I want to relate a little story. A few months ago my mother started reading this book. She’s a smart lady so I figured this should eventually lead to a little intellectual discourse. A few months passed and I asked her how it was going. Mum: I keep trying to read it before bed but then I fall asleep. Me: Yeah it can be a bit dense. It took me a little while to get through because there were parts I would go back and reread. Mum: It’s certainly not light reading. Mum: (oblivious) Well it is, but it’s not. Me: I would definitely call it *light* reading. To be fair this conversation took place really early after we had already trudged through some mind numbing chores and neither of us was at our best and honestly, the ability to pun without intent is pretty awesome. In my world puns are still the highest form of humour.